Every morning, I drink an Americano at my neighborhood cafe and enjoy a bit of alone time before I start my day. 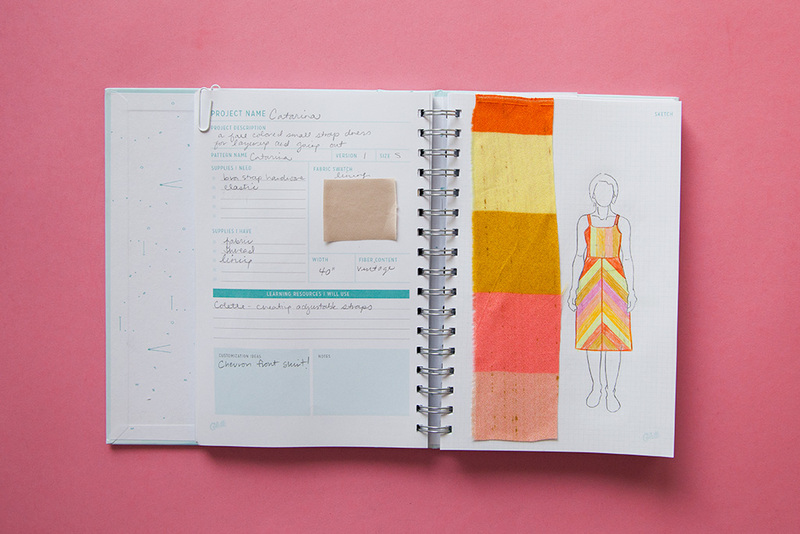 Recently, I’ve been whipping out my colored pencils and dreaming up new projects in my Colette Sewing Planner. It may look silly, but it’s the best “self-care” I can think of. I’m the sort of gal that has too many ideas, no time, and an absurd amount of fabric stashed in my tiny apartment. I love the chase—finding the perfect fabric, notions, and pattern combination, but never seem to get around to finishing much. It’s kind of like my thing with yoga; it’s an awesome idea but I need a really nice mat before I can really get into it. Over the summer, I challenged myself to not buy any new fabric until I finish at least 10 garments, which sort of happened… I made 5. But, it’s fall, when the holes in my wardrobe feel very apparent. Literally, I’m cold! Usually, when the weather changes, I end up splurging on a one-day shopping spree. I buy the transitional necessities without much thought on wardrobe building or what silhouettes will work best for my current style. It’s willy-nilly at best. But this year has been different, I got my hands on the sewing planner right when the leaves were beginning to change. I had plenty of time to really invest some thought into what sewing projects I could realistically make and what I would be happiest wearing. 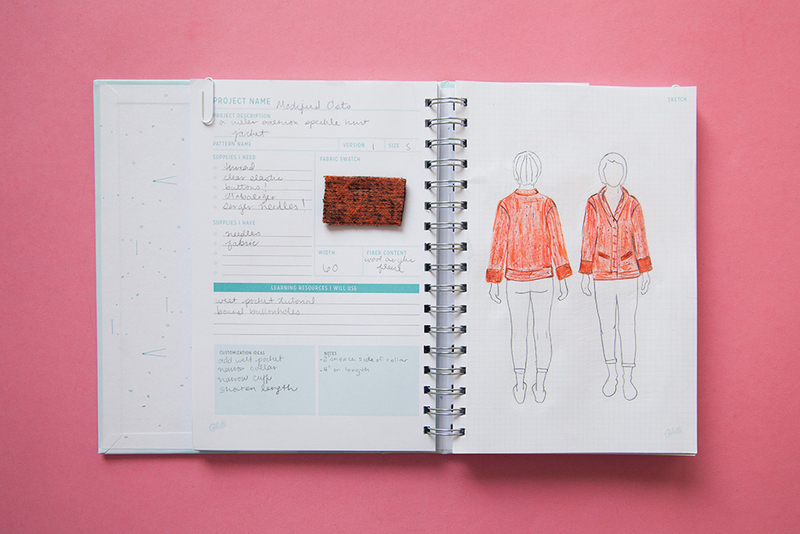 I started filling out my planner by pinning down some core aspects of my style, favorite design details and garments. It’s an interesting experience actually writing down what you feel best in. For instance, I love the way gathered sleeves look but don’t feel good in them. My noodle arms get even more gangly in them, no offense. Turns out, I like natural fibers, higher necklines, and need to admit that Portland is perpetually damp from October to May and should probably take that into account when planning my wardrobe. My favorite garments are the classic items in my closet, not my more unique items, which was also a surprise. 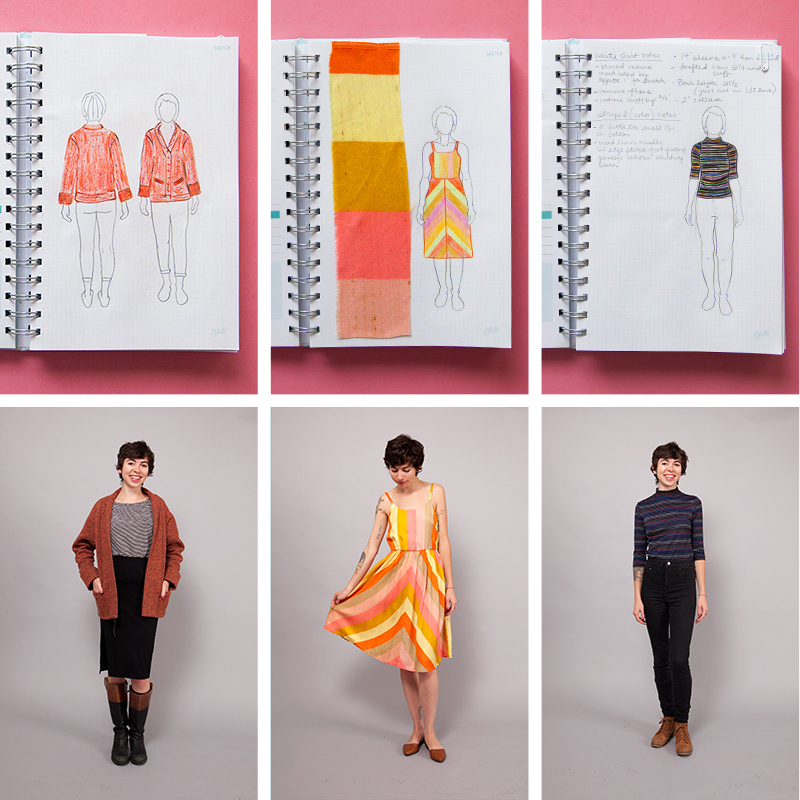 This Fall/Winter will be peppered with mustard, chartreuse, burnt orange, neutrals, and so many stripes. I’ve been dragging my feet about this resurgence of 90s fashion but the one thing I am so into are high necklines—mock collars for the win! My first project was a Modified Seamwork Oslo in a totally outrageous speckled wool knit that’s fleece lined!!! No more shivering in the rain for me. I wanted to essentially make a wearable blanket that had some tailored details that would keep it from looking too sloppy. The Oslo was a perfect base to start from and from there I added some welt pockets, narrowed the collar and cuffs, and shortened the length. The croquis were super helpful when planning this little number. I compared the photos from Seamwork to the proportions I wanted and made my lengthen and shorten decisions from the croquis rather than just chopping off length when I’m half way through sewing. I realized that I was in desperate need of some more fall-like separates and started planning a mock-collar Seamwork Neenah. This knit turtle-neck dress was a great base for making my dream mock-collar shirt for seasonal layering. I made two of them, one in white and one in stripes. 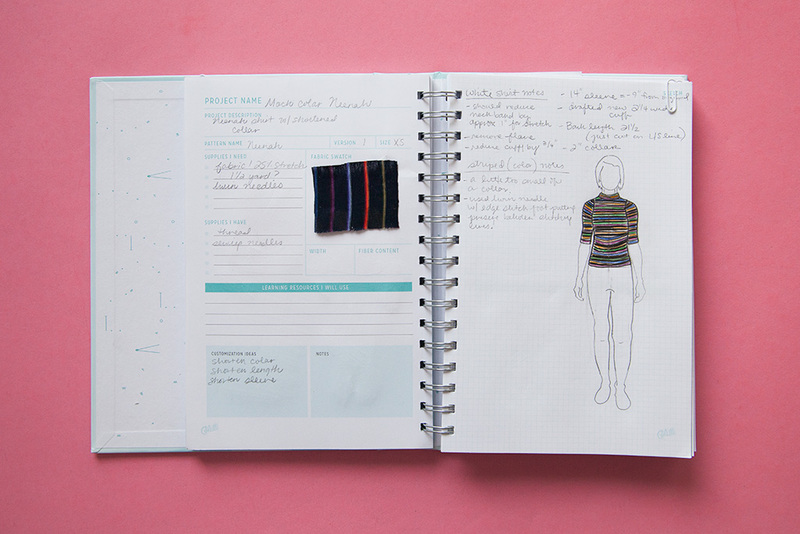 While sewing up the first one, I kept some “next time” notes in my planner to make sure that the striped top turned out even better. I’ve been holding onto this fabric for years and was so excited to sew up a Seamwork Catarina that would let the fabric shine. After drawing up my croquis, it was quickly bumped up to the top of my sewing queue. Because let’s be honest, it’s a knockout of a dress. Next up in my sewing queue is a full outfit, with two interchangeable pieces. The Seamwork Astoria is a fan favorite in the Seamwork catalog and I’ve yet to find time to sew one up! The fabrics are all from my stash, which makes me very proud of myself, and the silhouettes fit perfectly within my style goals. 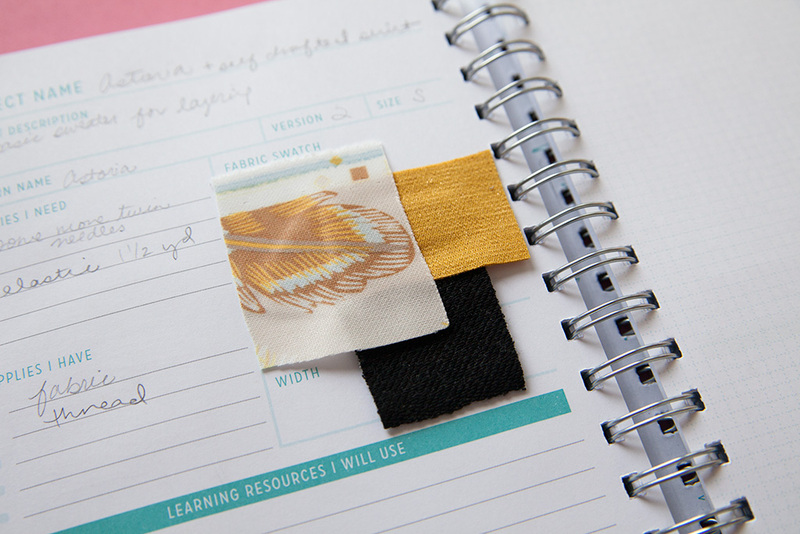 The combination of using The Colette Sewing Planner and quick-and-easy Seamwork patterns has really helped me get my projects done. What would usually take me months to finish, can be dreamt up during the week and sewn up in a Saturday afternoon. Are you like me? A willy-nilly sewer or an obsessive planner? 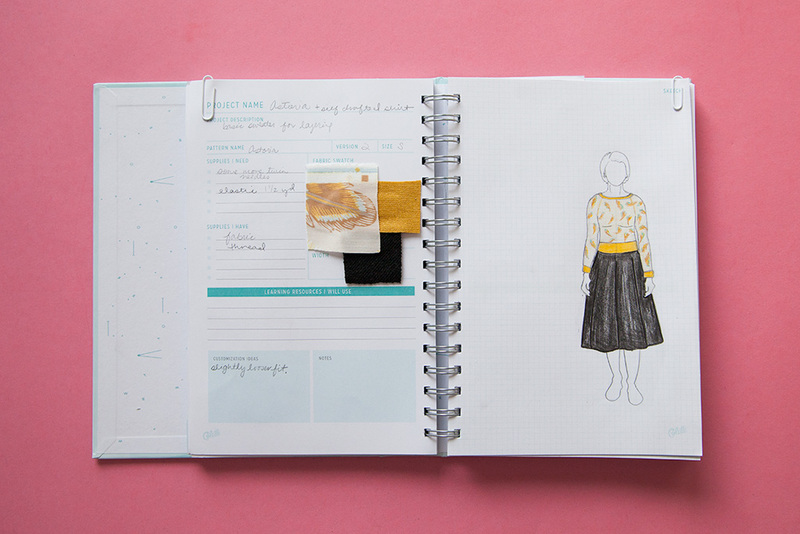 How do you see the planner helping you with your sewing goals? Sewing Chatter: Do you have trouble planning your sewing projects? 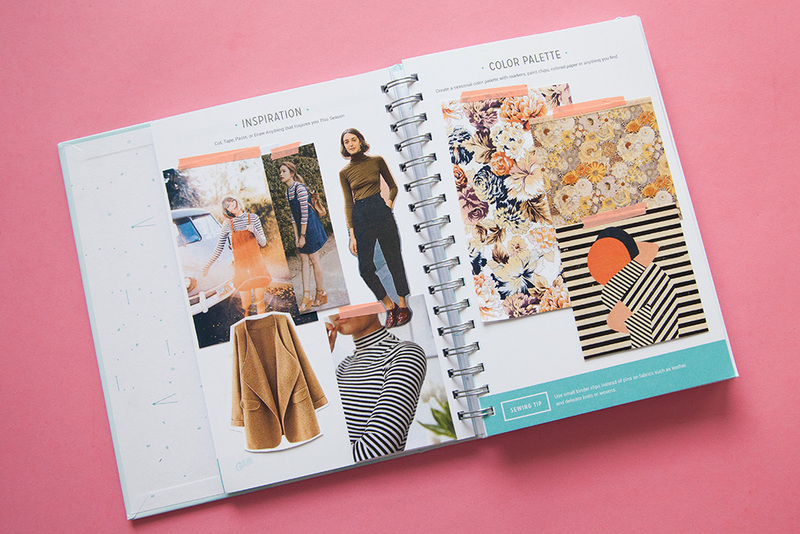 Introducing The Colette Sewing Planner! I love this idea. 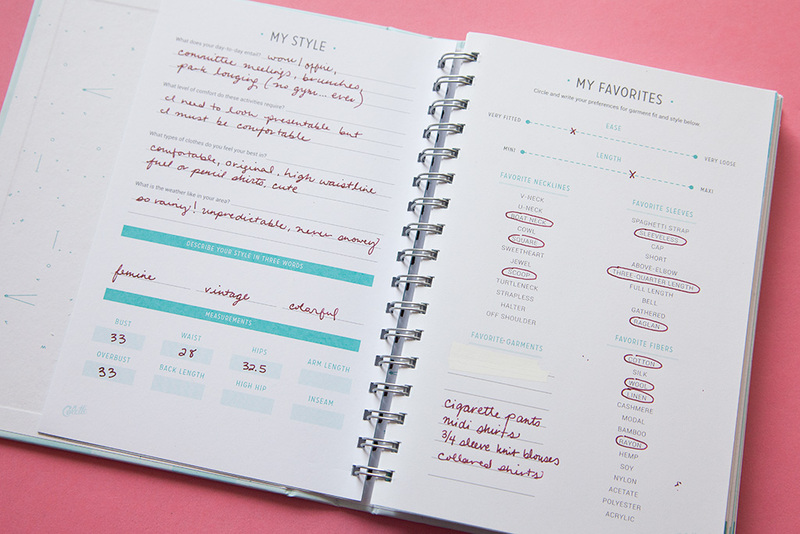 I’m not a HUGE planner… and being still a beginner sewer, I feel this planner would really help me in growing my me-made wardrobe. I’ve added it my “wish list”. Beautiful results, and you really showed me exactly how useful the planner can be. I know lots of beginning sewists who would love to “inherit” a stash. If you find one, they will be eternally grateful. Beautiful makes! After seeing your Catarina, I think my own Catarina plans will jump the queue. In addition to the lovely work you and the Colette staff have done in your respective planners, I also love the idea of sitting for a moment in a cafe, having coffee and doing some creative planning before heading to work. Now that my buses either get me to work too early or too late – and knowing that my own Colette Sewing Planner has been delivered and is waiting for me at home – I am considering taking the early, early bus and enjoying some cafe time before I clock in. I would love a tutorial about how to add pockets to and how to line the Oslo. I love that version of the oslo,. Where did you get that fabric? Hey Lynda! It is possible, especially if you sew up a size with a good amount of ease. The fabric I used for this Oslo had hardly any stretch so I sized up to make sure that it would give me room to move. We had a great article in September’s Seamwork that might be helpful, A Lesson in Lining, that may be very helpful. Hey Allison, We had a great article in September’s Seamwork that might be helpful, A Lesson in Lining, that will help you draft a lining for the Oslo. As for adding welt pockets, it just got added to my list for upcoming tutorials! Too many ideas + not enough time + insane amount of fabric?? Sounds like we are the same person! 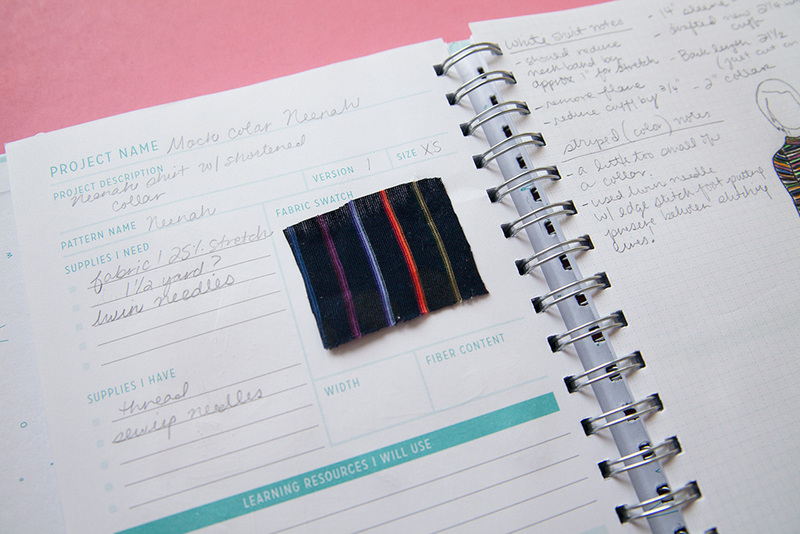 This planner is the jump start “yoga mat” I have been looking for to get back on the wardrobe capsule train that got derailed by advent of our first grandbaby(swoon) who got the mini wardrobe capsule instead– so, back out comes the fabric and planner and onward !! Thanks for the push?? I feel so jealous. 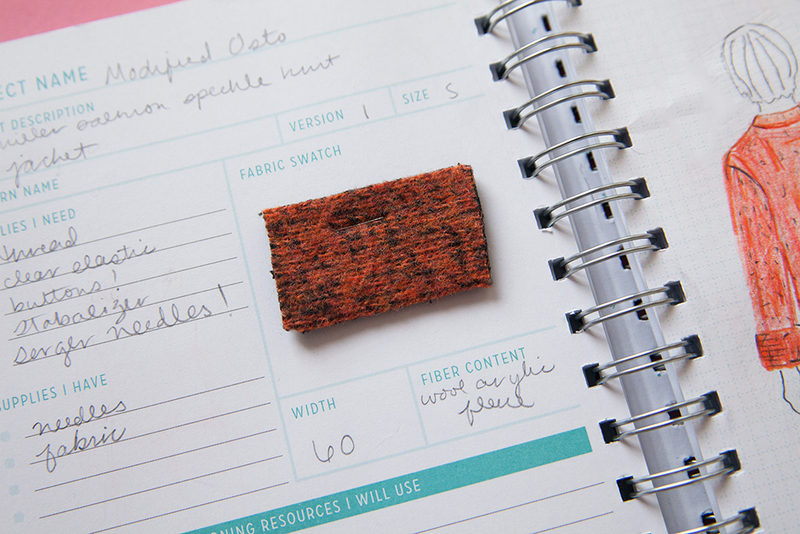 To be honest I have done this kind of thing with plain notebooks where I kept swatches and a catalogue of my patterns in the past. But the most difficult part of planning a project is matching fabric to the ideas on my head. I feel that no matter what I want to do, the available fabric I find, whether it be locally or online limits me here in Seattle. We have one really good local shop, otherwise I’m stuck with possibly sold out fabric by the time I grab a swatch online. So more scrapped plans! Typically I do find something but I have to rearrange the designs to match. Right now I’d do anything for cream colored medium weight wool knit with just a little stretch but spent several hours yesterday to no avail and am now using a black and white stripe. Still need that other color too. Holes. Oh well. Did you try natures fabrics or the fabric store? Both have great selections on high quality wool knits! I’m inspired by your fall wardrobe pieces. You look put together yet effortless. Thanks for sharing your makes and your process. Your palette is inspiring, and must echo that Catarina has such versatility (although as older woman, concerned about “too young” I’m loving the thought of layering). I LOVE your posts!!! Thank you! I have a question, where did you source the two “jumper/overall dress” pictures in your inspiration board?!? Trying to find a more adultish sort of overall dress is near impossible!! Seeing those pictures blew my mind! I totally need to add those pics to my board as well!! Kudos on the great eye and fantastic style!!! Hey Em! Check out my Pinterest board, all the goodies are in there! Also, did you see Tilly and the Button’s new pinafore pattern?!?! Oh man that DRESS. 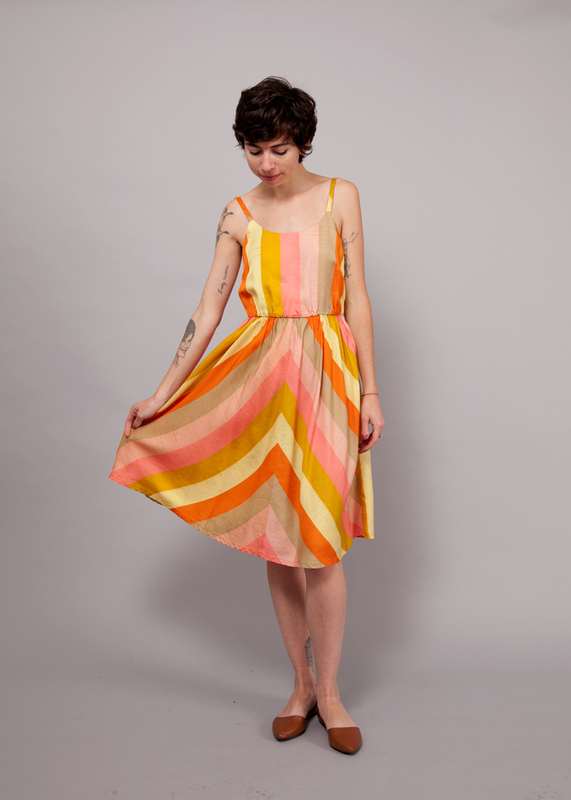 All the heart eyes, such a gorgeous garment! 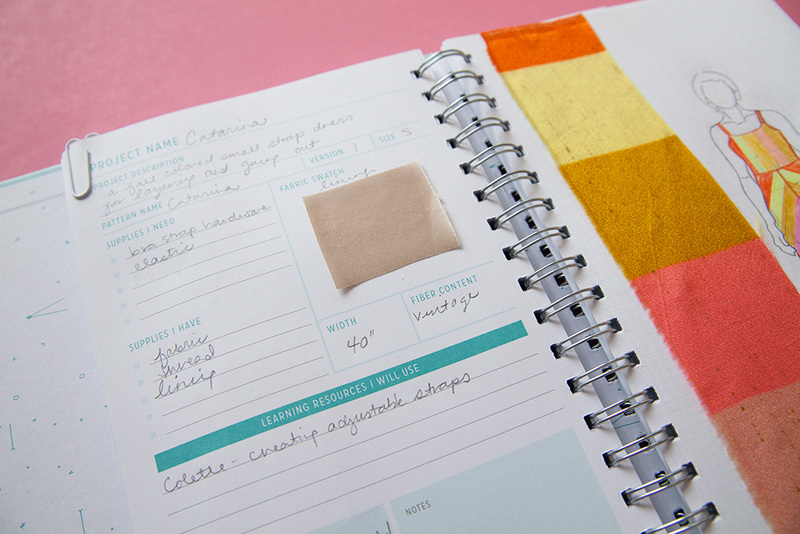 Hi Katie – love the way you have organized your planner. Just got mine and looking forward to filling it up! How did you get the croquis on your page? I outlined a copy with Sharpie so I could trace it, but it’s hard to see the outline thru the thick paper. I’d much rather have thick paper than thin, so am not complaining lol, just wondering how you got ur croquis on the page! Hey Mae! I’m excited for you to fill up your planner! I used this technique for tracing the croquis. It’s a technique I learned years ago and it came in super handy! Such a great way to get organized in this fashion industry!